Like a necklace for your head. 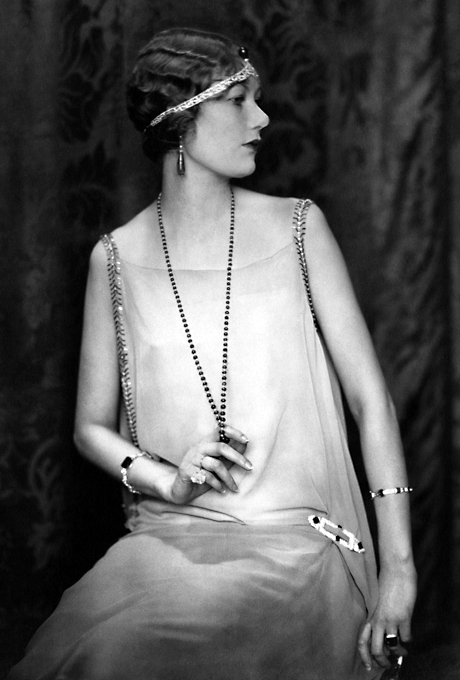 There are so many things to love about flapper style. The carefully waved bobs, the exaggerated makeup, the intricately beaded and fringed dresses, and a general zest for life—these are all things I’m trying to incorporate into my life in 2013. Left: source unknown; right: Het Leven magazine, 1920. For inspiration, I’ve been poring over photos of women in the 1920s, and I’ve also been dazzled by their freaking awesome headwear. Felt cloches, jeweled headbands, and elaborate crowns were de rigeur back then—you could probably pick one up at your local department store. Now, alas, they’re much harder to find. Lucky for us, this one—a simple, sparkling feathered halo inspired by the crowning glories of yore—is not only easy but also mighty cheap to make at home. Feathers of various sizes (I used a large peacock feather and some smaller white feathers). A flat pendant or brooch with lots of openwork (holes) that you can easily weave wire through (I got mine in the clearance section at Michaels). 1. Cut a length of wire long enough to fit around your head (it should rest on top, like a halo, without being too tight or falling onto your ears). Leave an inch of space extra for later. I like to use crafting wire because it’s strong, malleable, and extremely easy to thread beads onto. 2. String a bead onto one end of your wire, then loop the end of the wire down and twist it under the bead so that it’s secure, like a knot. This will prevent all your beads from sliding right off! 3. Fill the wire with beads until you have roughly an inch of bare wire left. Take that inch and twist it multiple times around the first knot you made, making sure it’s secure. Pretty, right? You can stop here if you want, or continue on if you crave MORE FLAIR. 5. Cut a piece of wire that’s a few inches long. Take out your largest feather, and place a few of your smaller ones around the base. Form a bunch by pinching them together at the quills (the little “stems” at the bottom). Then wrap the wire tightly around the quills to keep them together. 6. Press your brooch or pendant against the base of the feather bundle, then take loads of wire and just weave it through the openwork and around the feathers over and over until everything is firmly held in place. THIS IS BEAUTIFUL. oh, to be a flapper. Does anyone actually know how to get flapper waves? because I don’t and I would love to try it. Can you please do a how-to on how to do a fishtail braid? I second that! My hair is finally long enough for a fishtail braid now! They are RIDICULOUSLY easy. I feel so lame because I wanted to try them for years and it really is the simplest hairstyle to do! NOW MY LIFE IS OFFICIALLY COMPLETE. This is probably the greatest thing I’ve ever seen! Going on my DIY list!! The 1920s are literally my FAVORITE thing ever right now (though Françoise Hardy is giving them a real run for their money), so this is so amazinggg! I’ll have to make one this weekend. this is so so gorgeous i can’t even contemplate how gorgeous and perff it is. i’m trying to convince my friend to throw a gatsby party and if he does i am going to make a bajillion of these and omg omg i love this. Dude I want those magazines from the 20’s (that the picture of the flapper girl was from). And also I am TOTES doin this sometime :D so cuuuuteee. I love it. Rookie has the greatest ideas. Oh this is so awesome, I’m definitely going to try this! AND ALSO, the Phoenix Art Museum has a collection of women’s clothing from the 1920s on display right now. I went a few weeks ago, but ohmyGOSH everything was so beautiful!!! There was stuff by Chanel and ton of other wonderful designers. Ahh that’s gorgeous! I LOVE flapper style! I think if you really wanna up the flair, you could make several layers of those beaded-chain-things, and join them together… IDK. Who says we can’t all dress up like flappers on any given day? I literally just finished watching Metropolis, this is amazing. So lovely!! I’m going to have to make this! Wow!!! This is so pretty and shiny and I love it.